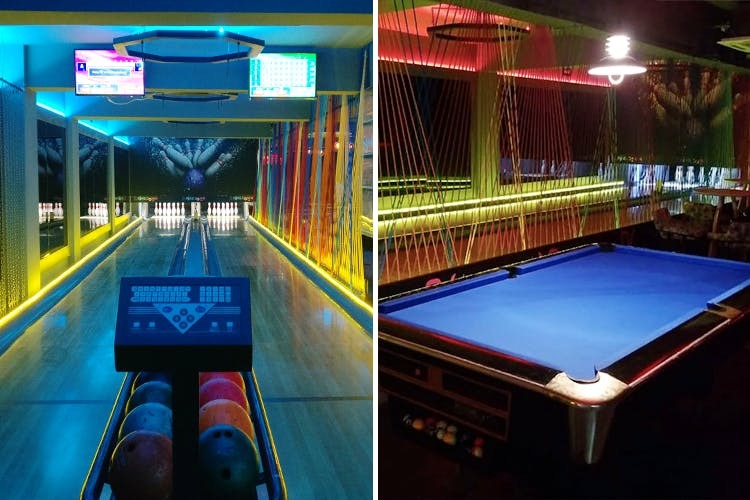 X Pins Down is a new sports bar in Punjabi that’s got a bowling alley, VR gaming, a pool table and arcade games. They’ve also got a bar and delicious finger food to munch on. If bowling strikes and killing zombies is your idea of fun, you might want to check this new space out. X Pins Down, a new sports bar in Punjabi Bagh, has immersive gaming experiences that’ll leave you hooked for hours. They’ve got bowling lanes for when you want to earn those bragging rights, VR gaming stations with a lot of games—from boxing to killing zombies, you get to do it all (make sure you don’t walk into a real wall in the heat of the moment), a racing simulator which moves and vibrates according to how you drive in the game, a pool table, and the old school basketball arcade game. They’ll be adding even more games in the future! You’ll also find a complete bar, so you can watch sports matches while sipping on your favourite cocktails and beer (they’re in process of getting their liquor license which is expected to happen in a couple of weeks). For now, the kitchen whips up delicious sandwiches, pizza, pasta and other finger food. Get your dose of immersive VR gaming, bowling and more games at X Pins Down!